It’s one of my favorite times of the school year. The warm sunshine and peeks of grass remind me that spring is around the corner. 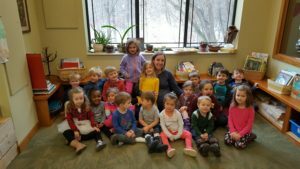 The days are longer, and the children are blissfully comfortable at school. We are all deeply connected, having shared many hours and meaningful moments together over the last six months. 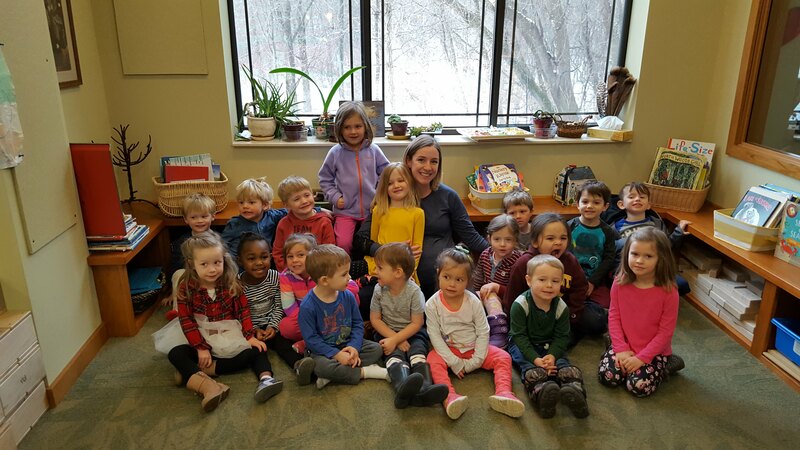 I’ve wiped tears and noses, held hands and given hugs, and laughed and learned alongside my students. But this spring I prepare not for walks in the blooming woods, gardening, and year-end reports. This spring I prepare for my own greatest time of challenge and transformation: Motherhood. I have a job that humbles me constantly. In the fall, with my tiny baby in my belly, I teared up reflecting on the trust parents had in me, who many of them hardly knew, as they handed off their screaming toddlers. Someday, would I be able to trust another to care for my child in that way? I’ve marveled with a special attention to the way each of our parents know their own child so very well, how they adjust their parenting for every little moment and need. Someday, would I know my daughter in that way? As I recently sat with parents at parent-teacher conferences, I appreciated their honesty and their humor. How will I see my daughter one day? Will I be able to be honest about her challenges as much as I can celebrate her strengths? I don’t know the answers to these questions, but I do know that the parents I’ve been so fortunate to know over the last six years at All Seasons have taught me more than I have ever taught them or their children. I am so grateful. I’ve felt it all around me this entire pregnancy — your support, concern, excitement, and love. So many of you have gone out of your way to offer me kindness and support. When I have a baby question, I know just who I’ll contact; you are the true experts. I can’t express my gratitude for this school without mentioning the staff. The women who run this school are my second family. I’ve asked them many times to raise my child for me (they thought I was joking). Many of them are extraordinary mothers themselves, rich with knowledge, experience, and humor. They pulled off a surprise baby shower under the guise of a licensing meeting, got me my favorite cake on my birthday, and outfitted me in XL men’s snow pants to get me through the winter. They were among the first people I contacted when we found out our baby was a girl (I think one of you still has a chicken cage to clean for betting it was a boy!). They haven’t batted an eye as I’ve had to make adjustments to what I’m able to physically and mentally do this year, even when it’s meant more work for them. Another facet of this wonderful place is the seniors. They’ve asked after me with the care only a grandparent can express, in a way filling the void I feel from the loss of my own grandparents. They’ve given me advice, shared their birth stories (I’m so grateful for modern medicine! ), and reminisced about their own lives as new parents. One of the things I look forward to most is visiting and seeing my baby in the arms of these dear people. 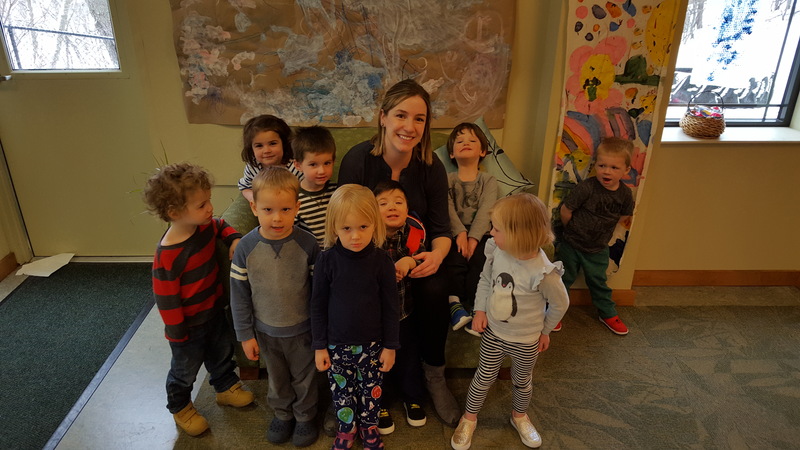 So despite the pain of sitting in tiny chairs and my near constant exposure to germs and various bodily fluids, I’m quite sure there is no better place to be pregnant, and in the fall, there will be no better place to be a new mom. It’s all thanks to this wonderful community. So I’m passing my classes on for this lovely season of spring, saying farewell for now as I prepare for the mystery of being a mom. Thank you doesn’t seem enough to say to all of you wonderful parents and teachers, but know I will pull a thread from each of you as I shape who I am as a mother. We left the building at dusk and within moments heard, “Look at the half moon! It’s a half moon! And stars! The stars are out because it’s night time!” This little girl’s exclamation was the reminder we all needed to notice our surroundings, familiar spaces that look entirely different in the dark. 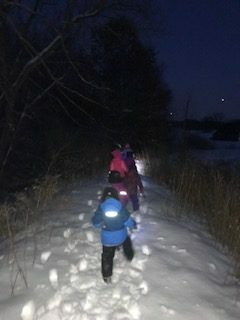 As the person who “sits at the desk,” this night hike was the best possible reminder of the part of our school’s mission that I don’t see on a daily basis; getting outside with children in all conditions. What a gift; an exclusive demonstration of what being outdoors with children can offer them at a time when youngsters are “sheltered” from what has only recently been considered too risky for them. That night, there was a reverence for our outdoor spaces in the dark. We began at the big snow pile, a familiar space right next to the building. As children noted the increasing darkness, teachers kept the mood playful, laughing, jumping and sliding down the hill of snow themselves. We decided to venture to the boulders and flashlights were turned on for the hike. “It’s getting really dark now! Turn on your flashlights, guys!” As we approached the boulders we heard this exchange. 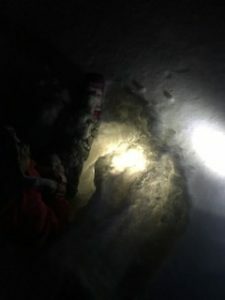 Flashlights buried in deep snow are still visible! Toward the end of our hike, there were two stragglers, tired from trudging through the deep snow. 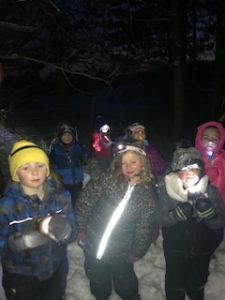 A teacher stayed behind, giving them a chance to rest and play with their flashlights. Seeing how far ahead the larger group was, a girl said, “It’s really dark now. I want to go back to our school. I’m a little scared.” The boy with her put his arm over her shoulder and said, “I’ll protect you.” And off they went to join their friends for hot chocolate on the playground.